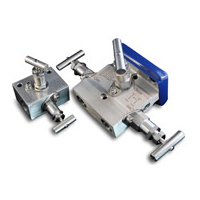 DK-LOK® 2, 3 and 5 valve manifolds are designed for liquid level, static and differential pressure applications. They are available in flange to flange, flange to pipe, flange to tube compression and pipe to pipe connection configurations to meet your system connection needs. Available in stainless steel and carbon steel as standard. Stem packing materials are PTFE as standard for system versatility, and Grafoil®, for temperature ratings to 1,200°F.